Cringing at the inevitable bitter disappointment when LeveL at large finds out that Cael isn’t a survivor so much as the cause of the holopaque storm. Leaves you to wonder how much propaganda was used around him… and for what purpose. Erato, what’s your real angle, here? I love your crowds of faces. So much little derails in there… so much little hilarious doodles that are too easy to miss at first glance. 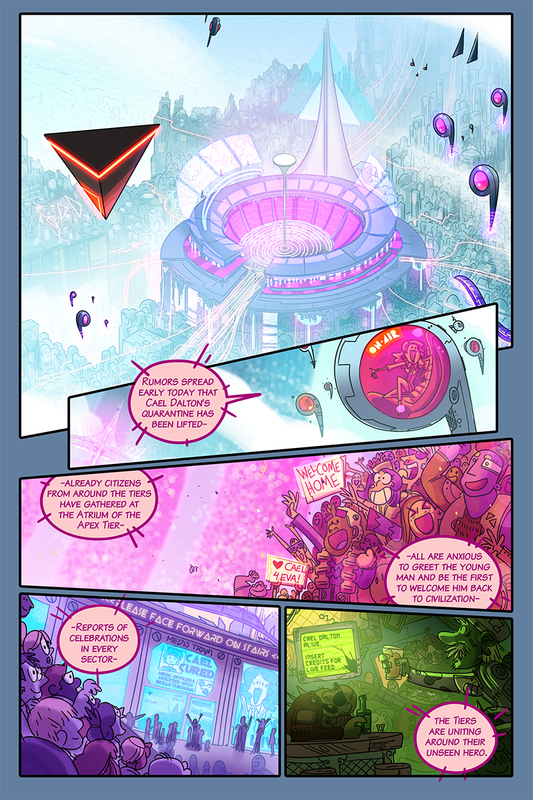 Lol I’m happy the crowds don’t just look ridiculous…to be honest I had to do those crowds so quickly I will probably go back and re-do them before I print the comic :X I could have worked on this page for weeks I wanted to show so much of the world.